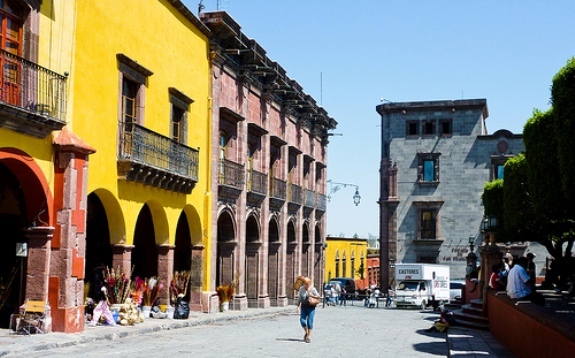 There are places in the world where artists seem to congregate and San Miguel de Allende in Mexico’s colonial highlands is one of them. They began arriving here in the late 1940s thanks to the establishment of two art schools, Instituto Allende and the Escuela de Bellas Artes, which drew, in particular, former American soldiers who were funded to study abroad on the G.I. Bill. Word spread and the bohemian generation of the 1960s and 1970s added to the stream of Americans coming to live in the city. Many who had studied there earlier have subsequently chosen to retire in this very creative center. Where there are artists, there are galleries, craft outlets, studios, performance venues, and design shops and art tourists looking to buy. Around 8,000 American expats now call San Miguel “home,” and thousands more visit each year. If you’re looking for a place to set up as an artist, designer, or creative entrepreneur this may be a good location for you. That’s certainly been the case for Patrice Wynne. The 61-year-old moved here back in 2000, and after living off retirement income for a while, she eventually purchased a house for $105,000 and spent a further $35,000 renovating it. In 2005 she began importing textiles in bold colors and patterns to create her own line of homewares and clothing, The San Miguel Designs Collection. Patrice employs local seamstresses to create her original aprons, handbags, table napkins, baby bibs, bathrobes, and other popular items, combining textiles in contrasting patterns. Her collection is sold to foreign tourists and Mexicans who vacation in San Miguel, and internationally through museums, airport stores, and boutiques. Initially, it was a home-based business. While working at home had many advantages, in 2010 she decided to open a boutique, AbraZos, in the heart of the Centro Historico of San Miguel. Her boutique remodeling and start-up costs came to just $12,400. It was all so much cheaper than California where she had lived for the previous 25 years, running an independent bookstore. When people ask Patrice about the difference between having a retail store in Berkeley and San Miguel, she replies, “Oh, about $8,000 a month.” Her retail rent is $700 and most costs are considerably lower than in the U.S. But more importantly, she says, the human side of doing business in Mexico is much less stressful, more relaxed, courteous, and enjoyable. She still works as many hours as she did in the U.S., but her work life is more creative and affords her the opportunity to travel all over Mexico selling her designs to stores in exciting locations like the Riviera Maya and Mexico City. • Take your time to figure out what you most enjoy doing. • Don’t expect anything to operate as it did in your country of origin. • Consult the best legal help in your community to advise you on legal and employment law. • Hire bilingual employees who can assist you in interpreting the subtleties of doing business in a foreign language. • And enjoy those endless “learning opportunities” that are sure to come your way.